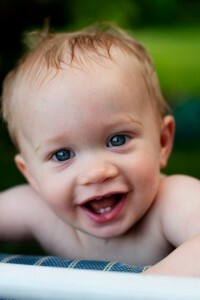 This blog post is going to concentrate on babies from birth until early childhood, before adult teeth begin erupting. There have been so many times here in the office that I’ve heard parents of our littlest patients say “well, they’re only baby teeth” when considering making appointments to have cavities fixed. A majority of the time, the appointment is made without a question but occasionally there is the skeptical parent who thinks that because the teeth aren’t there for long, that they aren’t important. The truth is, “baby teeth”, more commonly known as primary teeth in the dental world, are very important both to the health of the child and to the adult teeth that will take their place in the coming years. The 20 teeth that will erupt in your baby’s mouth during the first two and a half years of his life have been forming since before he even made his entrance into the world! This is why calcium is important during pregnancy, as it helps these teeth become stronger, and if the mom is deficient, her body will leach calcium from her own stores in order to give it to the developing fetus. Primary teeth are just as important as permanent teeth. They are used for chewing, speaking, and appearance. They also hold the space in the jaw for adult teeth, so if they are lost prematurely due to caries (cavities) and nothing is done, future alignment problems may occur when the adult teeth begin erupting. Once the teeth begin erupting, some babies (or most it seems!) may experience painful, sore, tender gums. You can try massaging your baby’s gums with a clean finger or a cool wet gauze pad to help alleviate discomfort. According to the ADA, contrary to popular belief a fever is not a normal occurrence with teething. If your infant has a fever while teething, call your doctor. The first teeth will begin erupting as early as 6 months (sometimes earlier) but sometimes not even until after the baby is a year old! As soon as teeth appear, decay can occur. One of the risk factors for early childhood caries is frequent and prolonged exposure of a baby’s teeth to liquids containing sugar, like sweetened water and fruit juice. Try not to put your baby to bed with a bottle, and offer water throughout the day to sip on rather than juice. No matter how a baby is fed, it is important to establish a dental hygiene routine in order to reduce the risk of caries. You can begin cleaning your baby’s mouth as soon as the first few days after he is born. Wiping the baby’s gums with a damp washcloth or gauze pad will remove plaque that can harm erupting teeth. When the teeth begin to erupt, they should be brushed gently with a soft bristled toothbrush and water. For children over the age of two, a pea-sized drop of fluoride toothpaste can be used. Be sure that they spit out the toothpaste and rinse with water afterwards. You can begin using floss as soon as the child has two teeth that touch. If you have any questions or concerns about your child’s teeth, please call our office at 262-784-7201.